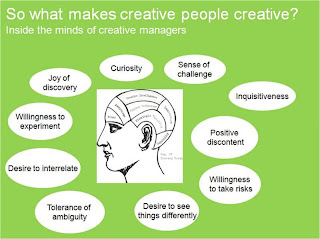 What makes a creative person creative? 'tolerance of ambiguity.' i like this. I'd have to say the "positive disconnect" gets the cake for me. Check out Richard Florida's site. He was on the Colbert Report a while back promoting his new book, btw. But he got the creative grph from another blog, I think. woops. i meant to say, that is quite interesting.